Viaplay started life as Viasat On Demand and since its inception has grown to be one of the most popular online streaming services in Sweden, Norway, Denmark and Finland. With many Scandinavians travelling the world the question of How to watch Viaplay in the UK and other countries is becoming a hot topic. We’ve helped thousands of users around the world unblock services such as iPlayer, Sky Go and more and thought it was time to put together a little guide on how to watch Viaplay from anywhere in the world. So keep on reading below and I’ll show you how. 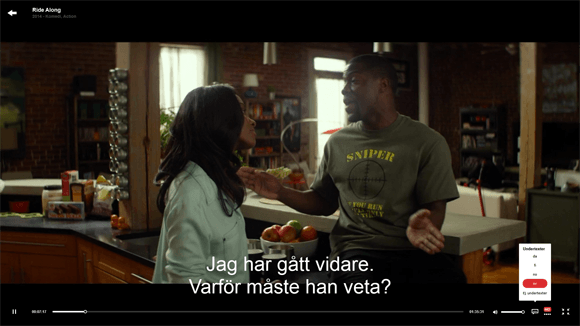 What do I need to watch Viaplay outside Scandinavia? Viaplay is available directly in Sweden, Norway, Denmark and Finland from viaplay.se, viaplay.no, viaplay.dk and viaplay.fi. One account will allow you to login to each site but only when you’re in that particular country. For example if you have a Swedish Viaplay account from Viaplay.se then you are able to login to each of the 4 localised versions of the site but only when you are in each country. 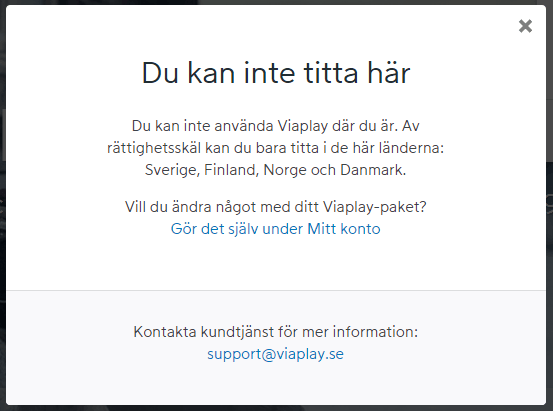 If you visit Denmark then you have to use Viaplay.dk, visit Norway and use Viaplay.no etc. When you’re outside any of these 4 countries you can’t directly access any of the content on any of the sites as you’ll be blocked. To watch Viaplay in the UK or any other country in the world you need to download a tool called a Virtual Private Network. A VPN allows you to encrypt your internet connection and also anonymise your location. The reason you can’t access Viaplay outside of Scandinavia is because the site can tell from your internet connection that you’re not in one of the four Scandinavian countries. A VPN allows you to alter the location of your internet connection so you give the impression you’re in another country. So when you’re in the UK, USA or any other country outside of Scandinavia you can use a VPN to appear as if you are in Sweden, Norway, Denmark or Finland and because of this Viaplay will then let you watch from anywhere in the world. Where do I get a VPN to watch Viaplay in the UK and elsewhere? There are literally thousands of companies around the world who offer VPN services and finding the best one to watch Viaplay in the UK or elsewhere can be a difficult and laborious task. Luckily we review VPN services on a regular basis and have been able to narrow down the search to the three top VPN providers for watching Viaplay. Our top recommendation to watch Viaplay anywhere in the world is a company called IPVanish. They are able to disguise your location and allow you to appear in Sweden, Norway, Denmark or Finland. This means no matter where you are you can access all 4 of the localised versions of the Viaplay website. You can watch the Swedish site if you’re in the UK, the Danish site if you’re in Norway or even the Finnish site if you’re in the USA, there is no limit. IPVanish offer simple software for Windows and Mac computers but also apps for iOS and Android so you can watch Viaplay across a range of devices. Their service costs $10 per month or US$6.49 if you take a yearly package. If you prefer to check out a few other good providers then our top recommendations are below. How do I use a VPN to watch Viaplay? Once you’ve signed up, download the software or app supplied and then simply connect to the country of the version of Viaplay you wish to watch and then visit that Viaplay site. Rather than seeing a blocked message you’ll now be able to stream content from Viaplay as if you are in your home country. Viaplay offer a free months trial so if you haven’t signed up before leaving your home country then you can still do so while abroad. If you already have a standard account or their “Viaplay Sport” or “Viaplay Sport + hela Allsvenskan från C More” package then these will be able to be watched in exactly the same way and with a VPN service you’ll be able to access the full range of shows that your subscription entitles you to. If you’re still a little unsure how easy this is take a look at our video below.